Bureau of Democracy, Human Rights and Labor International Religious Freedom released their 2016 Report detailing human rights violations, including some of what Shia face around the world. 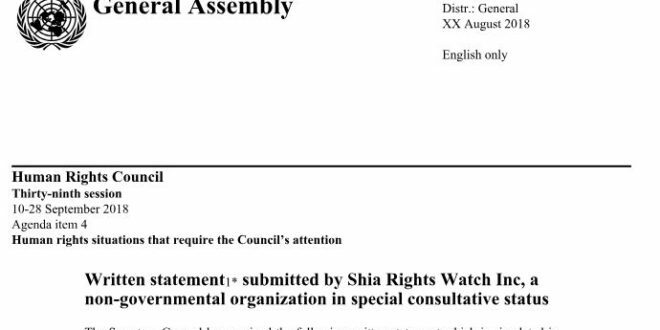 At Shia Rights Watch (SRW) we welcome this report and the attention given to the important issue of human right. Shia Rights Watch hopes to see more detailed report in following years with more collaboration between State Department and right NGOs. 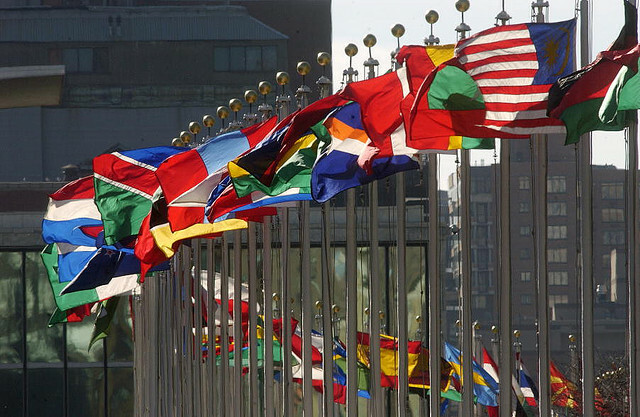 We believe highlighting minority rights in such reports will raise attention to these groups and result in more international effort to recognize and protect human rights of all. Shia clerics and activists who advocated for equal treatment of Shia Muslims were arrested, and the Shia cleric Nimr al-Nimr was executed after being convicted on a number of charges including inciting terrorism and sedition. The government convicted and imprisoned individuals on charges of apostasy, blasphemy, violating Islamic values and moral standards, insulting Islam, black magic, and sorcery. A pattern of prejudice and discrimination against Shia Muslims continued to occur with respect to access to public services and equitable representation in government, educational and public-sector employment opportunities, and judicial matters. There were attacks during the year targeting Shia worshipers. On July 4, there were two attacks, one in Medina against the Prophet’s Mosque, a holy site for both Sunnis and Shia, and the other in Qatif. On January 29, suicide attackers killed four and wounded 18 in an attack on Shia al-Ridha Mosque in al-Ahsa province. Authorities arrested Shia clerics and activists who advocated for equal treatment of Shia Muslims, and one Shia cleric was executed after being convicted of numerous charges including inciting terrorism and sedition. Authorities continued to engage in instances of prejudicial treatment and discrimination against Shia Muslims with respect to access to public services, equitable representation in government, educational and public-sector employment opportunities, and judicial matters. Authorities have arrested more than 1,000 Eastern Province Shia since 2011 in connection with public protests demanding greater rights for Shia. Shia Muslim groups that track arrests and convictions of Shia reported more than 300 persons remained in detention in prisons throughout Eastern Province and others remained subject to travel bans. Most were held on charges involving nonviolent offenses, including participating in or publicizing protests on social media, inciting unrest in the country, and insulting the king. Shia mosques were generally required to use the Sunni call to prayer, including in mixed neighborhoods of both Sunni and Shia residents. Shia were reportedly not represented in proportion to their numbers in academic positions in primary, secondary, and higher education and virtually all public school principals remained Sunni, while some teachers were Shia. In Najran, which has a high concentration of Ismaeli Shia, some Shia principals were hired but Najran University’s administration allegedly continued to discriminate in the hiring of Shia professors, according to a Shia academics. The government continued to exclude Shia perspectives from the extensive government-owned religious media and broadcast programming. Shia bookstores were reportedly unwilling or unable to obtain official operating licenses. Shia Muslims managed their own mosques under the supervision of Shia scholars. Most existing Shia mosques in Eastern Province did not seek official operating licenses, as doing so would require asking the government to extend its explicit endorsement of these mosques. The government did not finance the construction or maintenance of Shia mosques. Authorities prohibited Shia outside of the Eastern Province from building Shia-specific mosques. Construction of Shia mosques required government approval, and Shia communities were required to receive permission from their neighbors to start construction on mosques. Multiple reports from Shia groups cited discrimination in the judicial system as the catalyst for lengthy prison sentences handed down to Shia Muslims for engaging in political expression or organizing peaceful demonstrations. Reported instances of prejudice and discrimination against Shia Muslims continued to occur with respect to educational and public sector employment opportunities. Shia stated they experienced systemic government discrimination in hiring. There was no formal policy concerning the hiring and promotion of Shia in the private sector, but some Shia stated that public universities and employers discriminated against them, occasionally by identifying an applicant for education or employment as Shia simply by inquiring about the applicant’s hometown. Many Shia reportedly stated that openly identifying as Shia would negatively affect career advancement. Although Shia constituted approximately 10 to 15 percent of the total citizen population and at least one-quarter of the Eastern Province’s population, representation of Shia Muslims in senior government positions continued to be much below their proportion of the population, including in national security-related positions in the Ministry of Defense, the National Guard, and the MOI. There was only one Shia minister in the national government. There were no Shia governors, deputy governors, or ministry branch directors in the Eastern Province. At least two attacks occurred during the year that targeted places of worship. A suicide bomber detonated himself on July 4, the last day of Ramadan, killing four security personnel at the Prophet’s Mosque in Medina, a holy site for both Sunnis and Shia. Also on July 4, two suicide bombers attacked a Shia mosque, the Faraj Al-Omran Mosque in Qatif, Eastern Province, killing only themselves. On January 29, suicide attackers killed four and wounded 18 in an attack on Shia al-Ridha Mosque in al-Ahsa Province. Instances of prejudice and discrimination against Shia Muslims continued to occur with respect to private sector employment. Social media provided an outlet for citizens to discuss current events and religious issues, which sometimes included making disparaging remarks about members of various religious groups or “sects.” In addition, terms like “rejectionists,” which Shia considered insulting, were commonly found in public discourse. The government continued to question, detain, and arrest Shia clerics, community members, and opposition politicians. It convicted a Shia cleric on charges of giving an unauthorized sermon, and revoked the citizenship of Sheikh Isa Qassim. After Qassim’s supporters staged a sit-in demonstration around his home, police sealed off access to the neighborhood where Qassim lived, detained over 70 individuals in connection with the sit-in, and judges sentenced two Shia clerics to prison terms for participating in the sit-in. The police continued to restrict entry and exit into the predominately Shia neighborhood though the end of the year. In December an appeals court agreed with an earlier appeals court and resentenced Sheikh Ali Salman, Secretary General of the Shia opposition political society Wifaq, to nine years after he continued to appeal his 2014 conviction and four-year sentence on charges of inciting hatred and promoting disobedience to the law. Representatives of the Shia community reported the continued higher unemployment rate and lower socioeconomic status of Shia were exacerbated by continued discrimination against Shia in the private as well as the public sectors. On August 31, a court sentenced Sayed Majeed al-Mashaal, former leader of the Ulama Islamic Council, to two years in prison based on accusations he had calling on the population to rally outside Qassim’s house. On August 18, a court convicted Sheikh Ali Humaidan of “illegal gathering” and sentenced him to one year in prison for his involvement in the sit-in. On August 14, police summoned Sheikh Maytham al-Salman for questioning and held him overnight, on suspicions he had participated in the sit-in in Diraz. Police reportedly refused four requests by him to have a lawyer present, saying they had no orders to allow a lawyer to be present. They reportedly kept him awake in an interview room for more than a day without allowing him to change his clothes or take a shower and required him to remove his clerical robe and turban, which he said was a measure intended to “insult and intimidate a Shia cleric.” He was released on August 15, and as of year’s end a date had not been set for his trial. The government continued to not provide regular statistics on detainees, but according to a report on Jaw Prison published in January by the government-funded Prisoner and Detainee Rights Commission, the courts had sentenced 1021 of the 2468. Local human rights organizations and activists stated individuals imprisoned were overwhelmingly Shia. International NGOs reported Shia prisoners were vulnerable to intimidation, harassment, and ill-treatment by prison guards because of their religion, which at times led to coerced confessions. Some Shia prisoners at Jaw Prison and at the pretrial Dry Dock facility reported they were not allowed to practice their faith freely. Activists also continued to report the interview panel for university scholarships asked about students’ political views and family background if their name or address suggested they might be Shia, and believed the panels used such information to select out Shia. The activists said many top scoring Shia applicants continued to receive scholarship offers in less lucrative or less prestigious fields. In November several groups in Karachi protested after the police arrested Allama Mirza Yousuf Hussain, a prominent Shia cleric, and Faisal Raza Abidi, a Shia and former senator. Hussain was arrested under a law meant to curb the misuse of loudspeakers for hate speech for allegedly instigating violence during a speech in May at the funeral of rights activist Khurram Zaki. Hussain was released on bail a few days later. Sectarian violent extremist groups targeted Shia houses of worship, religious gatherings, religious leaders, and other individuals in attacks resulting in 25 people killed and 19 others injured in 16 separate attacks throughout the country, according to a public database of attacks. Jamaat-ul-Ahrar (JuA), claimed responsibility for two attacks in Shikarpur that injured 13 people at a Shia mosque and congregation hall on September 13. Media reported that two men on a motorbike threw a homemade explosive device at a Shia congregation hall in Karachi on October 17, killing one child and injuring 20 others. Lashkar-e-Jhanvgi al-Alami, a cell of the Sunni LeJ, claimed responsibility for the attack. On October 29, unidentified gunmen opened fire on a Shia gathering in Karachi’s Nazimabad area, killing five and injuring six. Lashkar-e-Jhanvgi al-Alami claimed responsibility for the attack. Terrorist groups also continued to target the predominantly Shia Hazara community. Suspected militants shot and killed a Hazara man in Quetta on December 8. Gunmen in Quetta killed two Hazara Shia men on August 1, with JuA claiming responsibility for the attack. Throughout the year, unidentified attackers targeted and killed Shia, Hazaras, and Ahmadis in attacks believed to be religiously motivated, including multiple attacks during the Islamic month of Muharram. On November 11, three Shia students were shot by unknown gunmen on a motorbike; one of the students died from his wounds. On October 7, gunmen shot four Shia men in two separate incidents in Karachi, killing one. Prominent Shia civil society activist Syed Khurram Zaki was shot and killed in Karachi on May 7 in an apparent targeted killing. Four Shia were killed in two separate incidents on May 5 in Dera Ismail Khan in KP, prompting protests in the area. On April 8, unidentified gunmen in Karachi killed three men outside a Shia mosque in Karachi. Unidentified assailants regularly targeted the predominantly Shia Hazara community. On November 30, unidentified assailants killed a Hazara woman in Quetta. On October 4, gunmen boarded a bus in Quetta and shot five Hazara Shia women, killing four. Shia Muslims, although holding some major government positions, said the number of positions did not reflect their demographics and complained the government neglected security in majority-Shia areas. The ISKP publicly claimed responsibility for attacks killing over 100 members of the Shia community. In July a suicide bombing targeted a protest attended primarily by members of the Shia-majority Hazara community, killing at least 97 and injuring more than 260. In October gunmen entered the Karte-Sakhi mosque and opened fire on worshippers gathering to mark the Shia holiday of Ashura, killing 17 worshippers and wounding 58, including women and children. The ISKP claimed responsibility for both attacks. The Taliban were responsible for a number of kidnappings of Shia Hazaras and continued to threaten clerics with death for preaching messages contrary to the Taliban’s interpretation of Islam. In November a suicide bomber struck a gathering of Shia Muslims commemorating Arbaeen, a Shia observance of loss and grief, in the Baqir ul-Uloom mosque in western Kabul, killing at least 30. ISIS subsequently claimed responsibility. Shia leaders urged the Shia community to avoid any violent reaction that might escalate tensions between Sunnis and Shia, and asked the government to investigate the incident and take necessary steps to protect Shia. In September 8 Hazaras traveling from Bamiyan to Kabul were reportedly kidnapped in Wardak province, just 150 meters away from a police checkpoint. In another incident, a group of militants stopped two passenger vans in Ghor province. The militants singled out five passengers they identified as Hazaras, and took them away at gunpoint. According to government contacts, the Hazaras were kidnapped by the Taliban, who were hoping to exchange them for one of their commanders. One student was killed when government forces attempted to secure their release, while the rest were later freed when tribal elders intervened to mediate. In Ghazni, a student was killed during a clash between the Taliban and government security forces following a Taliban attempt to abduct 6 Hazara students. In October the Taliban abducted 25 Hazaras traveling on the Kabul-Bamiyan Highway. Reportedly “Intolerant groups,” disrupted religious gatherings, illegally closed houses of worship, and widely disseminated materials promoting intolerance. Shia Muslims and Christians reported threats of violence and intimidation for gathering in public or attempting to return to their hometowns to celebrate holidays. Other local regulations forbid or limit the religious activities of minority religious groups, especially Shia and Ahmadi Muslims. Local governments selectively enforced blasphemy laws, permitting regulations, and other local regulations in ways that affected various religious groups. For example, local governments issued decrees banning Ahmadi and Shia teachings, and reportedly did not act when threats were made against these groups. Other religious minorities such as Ahmadi and Shia Muslims and Christians faced problems even when seeking approval to move to temporary facilities while a primary place of worship underwent renovation. Religious minority communities said administrative suspicions and inaction blocked renovation or construction of new facilities even when they fulfilled the legal prerequisites. NGOs warned of rising anti-Shia sentiment in East Java, the heartland of the Nahdlatul Ulema (NU). According to reports, local NU-affiliated imams continued to block reconciliation and the return of Shia internally displaced people (IDPs) to their homes in a case that has continued for several years. Several days before Eid al-Fitr, certain local Sunnis in East Java prevented hundreds of Shia IDPs from returning to their homes on Madura for the holiday. They threatened to kill Shia who tried to return and harm people who assisted them. More than 300 Shia reportedly remained displaced and unable to return to Madura. Anti-Shia rhetoric was also common in some online media outlets and on social media. On April 1, hundreds of people calling themselves the Aswaja (Adherents to the Sunnah and the Community), a loose coalition of a number of NU and Persatuan (an Islamic educational organization) schools, broke up a gathering of 100 Shia women in Pasuruan district south of Surabaya. The women were celebrating the birthday of the Prophet’s daughter, Fatima, an important event in Shia tradition. Police, military, and district public order forces who were present to safeguard the event responded to Aswaja’s demands, and after two hours the Shia dispersed. In North Maluku, on August 24, seven members of the Shia Jafariyah congregation led by Nawawi Husni were subject to intimidation by local residents after holding a religious event in Marikurubu Subdistrict. Local police were deployed to ensure the safety of the Shia members. The police later evacuated the congregation to the police headquarters after local residents tried to damage their houses. The Shia eventually returned safely to their homes. In the wake of the June 2015 bombing of the Imam Al-Sadeq Mosque, the government continued to order the Shia community to commemorate Ashura and other holidays indoors; it retained other steps it defined as security measures that affected all non-Sunni religious groups. The government questioned several imams, and in some cases banned some of them, for making what it considered provocative statements harmful to national unity. In January the government prevented several foreign imams from entering the country because it accused them of “terrorism and sectarianism.” The government permanently prohibited four imams from speaking in mosques because of comments they had made, which the government disapproved. The government kept in place the ban on outdoor religious observances, for what it stated was security concerns, instituted following the bombing of the Imam al Sadeq Mosque in June 2015, which killed 26 persons. All Ashura activities for the Shia community were required to be conducted inside closed structures rather than at outside locations. The government did not permit public reenactments of the martyrdom of Hussein or public marches in commemoration of Ashura. The government continued to monitor the statements and views of senior Shia religious leaders. Shia religious leaders who did not support government policies or supreme leader Ali Khamenei’s views reportedly continued to face intimidation, arrest, and imprisonment on charges related to religious offenses. Critics stated clerical courts were used to control non-Shia Muslim clerics, as well as to prosecute Shia clerics who expressed controversial ideas and participated in activities outside the sphere of religion, such as journalism or reformist political activities. On August 16, Vice President for Legal Affairs Majid Ansari declared cases of individuals and entities who insulted the president would be tried in the Special Clerical Courts. According to Amnesty International, Shia cleric Ayatollah Hossein Kazemeini Boroujerdi, serving an 11-year sentence after conviction on charges including “moharebeh” and “abusing his clerical flock,” was transferred to a medical clinic on January 19 to treat recurring stomach pain, nausea, vomiting, and dizziness, but was returned by prison officials to his cell the same day without undergoing full treatment. Grand Ayatollah Mohammad Reza Nekounam, who was originally arrested in 2015, remained in prison in Qom despite appeals for his release on medical grounds to the Special Clerical Court after he suffered a stroke during the year while in solitary confinement, according to Human Rights Activist News Agency (HRANA). Reportedly, the authorities brought him before the Special Clerical Court in June for further investigation. The United Nations Assistance Mission to Iraq (UNAMI) reported ISIS IEDs caused at least 5,403 casualties (1,167 killed and 4,236 wounded), amounting to half of all verified casualties in the first half of the year. Coordinated ISIS bomb attacks continued to target Shia neighborhoods, markets, mosques, and funeral processions, as well as Shia shrines. On July 3, a coordinated bomb attack in Baghdad resulted in the deaths of more than 300 and injuries to hundreds more. A few minutes after midnight, a suicide bomber in a truck targeted the mainly Shia district of Karrada, busy with late-night shoppers for Ramadan. A second roadside bomb was detonated in the suburb of Sha’ab, killing at least five. On April 4, there were multiple coordinated suicide bombings, including two in the Shia-majority southern provinces of Basrah and Dui War. Five people died in Basrah and in Dui War, and 14 people were killed and 27 wounded at a restaurant popular with Shia PMF fighters. ISIS claimed responsibility for the attacks. According to the mayor of Sinjar, as of September 27, mass graves containing the remains of ISIS victims were under investigation. NGOs reported ISIS continued to kidnap religious minorities for ransom. According to officials from a Turkmen Women’s Association, ISIS militants had kidnapped and held 500 Turkmen women and children from Tal Afar and Mosul since June 2014. A Shabak member of the Ninewa Provincial Council said ISIS held over 250 Shabak people (most of whom are thought to be Shia) captive, and had executed three Shabaks in October. The government continued actions against Shia Muslims engaged in religious practice. In October the Selangor State Islamic Department (JAIS) detained 50 Pakistani nationals believed to be Shia Muslims at an event to mark the day of Ashura. The government prohibited publications, public events, and public debates that it stated might incite religious disharmony. Officials at the federal and state levels oversaw Islamic religious activities, distributed sermon texts for mosques to follow, used mosques to convey political messages, and limited public expression of religion. In January JAKIM released pamphlets, flyers, and other promotional materials that said Shia Muslims were potential “radical” threats. The federal and state governments continued to forbid religious assembly and worship for groups considered to be deviant Islamic groups such as Shia, Ahmadiyya, and Al-Arqam. In August a court in Kuala Lumpur upheld the government’s ban of four books by novelist Faisal Tehrani for allegedly spreading Shia teachings. On November 14, Nigerian security forces clashed with members of the IMN who were marching from Kano city to Zaria, resulting in an indeterminate number of deaths and injuries. According to the police, nine people died, including members of the police, while the IMN said 100 of its members were killed and 87 detained. Other reports estimated several dozen dead and well over 100 injured as a result of the violence. Members of the Shia group were embarking on their annual symbolic pilgrimage to Zaria, Kaduna State, to mark the end of the 40-day period of remembrance of the death of Imam Hussein. Katsina, Kebbi, Kano, and Jigawa States banned religious processions just prior to the annual Ashura processions, performed by Shia Muslims worldwide in remembrance of the death of Imam Hussein. According to the international NGO Forum 18, Inqilab Ehadli, a Shia Muslim, was arrested in January and transferred to the secret police Investigation Prison for allegedly supporting the Muslim Unity Movement. A human rights activist reportedly told Forum 18 Ehadli had been in poor health when arrested and as of April was in critical condition in a prison hospital. No further information on his case was available. In May authorities and the police demolished a Shia seminary in Nardaran reportedly in order to widen a street that residents said could not be widened. Community members filed a complaint with the judicial authorities. No further information was available about this case as of the end of the year. In February President Ilham Aliyev participated in the opening ceremony of the Shia Imamzade religious center in Ganja after its extensive renovation. Some government entities continued to use anti-Shia rhetoric in the country. In January Al Azhar canceled a competition entitled “The Spread of Shia Islam in the Sunni Community: Reasons, Dangers, and How to Confront It.” According to press reports, the cancellation was due to the Grand Imam of Al-Azhar’s desire to promote unity and fraternity among Muslims. On November 5, the press reported that residents in Ezbet Talata village in Damietta Governorate filed a complaint about a teacher who had converted from Sunni to Shia Islam and whom they alleged was preaching the Shia faith to her students. Residents had learned about her conversion after she called in to a Shia satellite channel. The Ministry of Education subsequently transferred the teacher to another school in a different village. When her landlord in the new village learned that she was a Shia he evicted her, according to the mayor of Ezbet Talata. The teacher returned to Ezbet Talata but residents there ostracized her, the mayor told the press in a video interview. Representatives of some Salafist groups, including the Coalition of Muslims in Defense of the Companions and the Prophet’s Family, published negative remarks about Shia Muslims. On February 1, the group threatened to sue the minister of culture for “spreading Shia ideology” when the minister rejected their calls to confiscate Shia books exhibited at the Cairo International Book Fair. Nonstate actors, including a number of groups designated as terrorist organizations by the United States and other governments, such as ISIS and Jabhat al-Nusra (JAN, also known as al-Nusra Front), targeted Shia, Alawites, Christians, and other religious minorities. ISIS destroyed churches, Shia shrines, and other religious heritage sites. JAN and other rebel groups continued to subject the surrounded Shia villages of Fu’a and Kafraya to periodic violence. ISIS claimed responsibility for the killing of a Shia preacher, Hadith Abdur Razzak, who was stabbed to death in Jhenaidah on March 14.